Since this is a rather critical than “blingbling” kind of fashion blog, I’d like to go a little bit deeper into the field of EXPLOITATION in the fashion industry. Depending on your attitude, this is probably a never ending story, but I want to point out two aspects that I find exceptionally striking. So Zara and its mother company Inditex has been critized by fur activist for selling real fur in their stores several times in the last years and claimed 2009 to no longer use fur, but actually they still do like many others. In response to a demonstration in Cologne against fur production verbally attacking INDITEX, the company replied: “All animal products used in those articles supplied to the Group shall come from animal reared in farms to obtain meat.” Apart from this fact being irrelevant, we can also see how the consumers were tricked on purpose and how INDITEX broke it’s word. 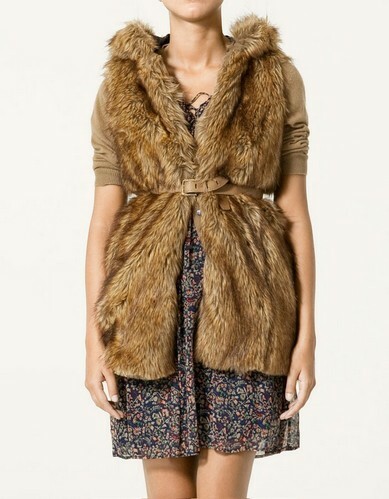 Though I have to admit, I’ve seen A LOT of faux fur in the stores which is in my opinion a step in the right direction, but I also think that such a big and influencing company should show some more commitment and consistency. Reflecting the number of items, a company like Zara produces, it is quite obvious how even a few pieces with real fur sum up to thousands of tortured animals. Personally, I’ve never been big of a fur fan, but those videos cleared my mind once more. It’s really depressing, how nowadays you can shop hardy anything in good conscience. I really hope, that’s going to change soon. What else would a “Ministerium für Verbraucherschutz” be good for..?! 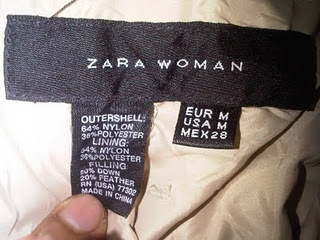 Most of us (students/young ppl) like cheap clothes and we all noticed the “made in vietnam/china/india/turkey…..” signs in our stuff. Obviously, the people working there to sew clothes for Europe or the US don’t get paid in our standards… But still, no one would really think that working conditions are AS bad, as they turned out to be. August 2011. HUGE scandal. Zara is accused of alleged slave labor and child labor in Brazil. The press was full of it! Apparently, Inditex has approximately 50 suppliers in Brazil, which employ more than 7,000 workers.There are hundreds of factories in Sao Paulo state, producing garments for Brazil’s booming market. According to a BBC article, many of the workers are smuggled into Brazil from Bolivia and Peru. I found on a different blog information that, in search of a better life. When they arrived in Brazil, they had to work long hours over a number of months just to pay off the cost of transportation to Brazil. During the operation, inspectors seized two notebooks filled with debt related to “pass” and “documents”, and “valleys” that caused employees to further increase their debt. The specific details show some of the wages received by employees: from $274 to $460, much less than the minimum wage in the country, which is $545. Turns out, Zara received accusations including illegal child labour, degrading, exhausting journeys of up to 16 hours daily and curtailment of freedom (prohibition of leaving the workplace without permission!!!). According to Inditex, there will be an increase in the review of the production system to ensure there is not another case like this, but I highly doubt that since supervision of all the productions in Latin America would be WAY to costly. So I’ll keep my eyes open for any other cases like that because I think that if anything like this was to happen AGAIN, Zara will be in BIG trouble….